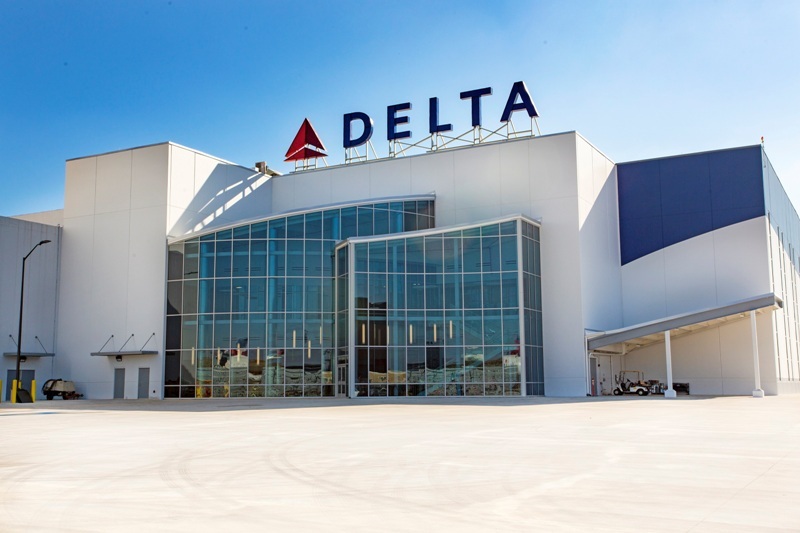 Delta’s new test cell will offer repair capabilities for newer engine models. Credit: Delta Air Lines, Inc.
US-based airline Delta has completed the construction of a jet engine test cell, which will be used to test various types of new and larger engines. Construction of the test cell started with a ground-breaking ceremony around 18 months ago and the company plans to officially open it next month. The cell is expected to enable Delta to achieve its goal of repairing newer engine models and facilitating the carrier’s future demand. The 48ft-tall test cell is equipped with a 66ft-long inlet section and a 78ft-long exhaust section. It is designed to safely run a mounted, stationary engine at full power with a thrust of 150,000lb. Delta’s existing test cell is capable of providing 68,000lbof thrust. The new engine test cell is expected to enable Delta test larger engines such as Trent 1000, 7000 and XWB, as well as the PW1100 and PW1500 variants of the Geared Turbofan. By installing new capabilities and facilities, Delta intends to expand its maintenance, repair and operations (MRO) business by $1bn a year over the next five years. In October 2015, Delta signed a formal agreement with Rolls-Royce for allowing Delta TechOps to become an authorised maintenance centre for Rolls-Royce engines. As part of the deal, Delta will provide engine services for the Trent XWB, Trent 1000 and Trent 7000, and the BR715 engine family.